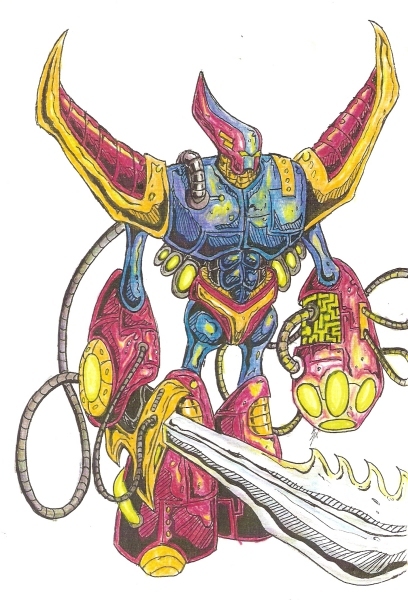 The Mega Menga Warrior was created by a 10-year-old boy named Yasuki Ichikawa. Yasuki was a normal boy living on a poor farm in Okinawa. Around his 10th birthday Yasuki began to experience a huge increase in intellect. He began developing advanced skills in math and began creating amazing inventions. As with the rest of Japan, Okinawa was plagued with monster attacks. Several monsters had attacked the Ichikawa family farm in recent years destroying the family’s only means of food and income. Scared of another monster attack and lonely from being the only child in the family Yasuki built a robot to be his protector and friend. He named the robot Ko Guu (Japanese for “Big Friend”). The technology Yasuki used in creating Ko Guu was so advanced that the robot’s computer brain allowed it to have conscious thought. In other words, it was aware of its own existence. Ko Guu himself was able to learn and develop skills. 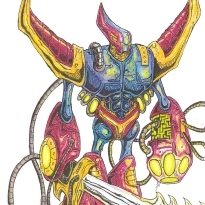 Learning of the potential for another monster attack, Ko Guu began designing weapons and upgrading his body. After gaining more scientific knowledge through books it was Ko Guu that discovered that the reason for Yasuki’s sudden increase in intellect was due to a brain tumour. Yasuki and Ko Guu became best friends, with Ko Guu always at his young companion’s side. One day, while the pair was out in the woods, Yasuki died from his disease. Ko Guu was devastated and remained with the boy for quite some time before carrying him back to the farm. The boy’s family, unaware of his illness, thought Ko Guu was to blame and banished him from the farm. The saddened Ko Guu wandered out into the forest and sat there for several weeks. Then one day there was a huge commotion in the woods. A reptile monster was rampaging through the countryside, destroying everything in its path. Ko Guu followed the monster to the family farm where it destroyed the farm and killed all of Yasuki’s family. Ko Guu battled the monster and killed it. Then Ko Guu noticed a grave made where the family had buried Yasuki. Ko Guu uprooted Yasuki’s favourite tree that the boy had recently planted and planted it on the spot where he was buried. Ko Guu then started walking away from the family farm alone, in search of a new friend.